Ryokan, Hotel, Minshuku in Japan - Let's travel around Japan! 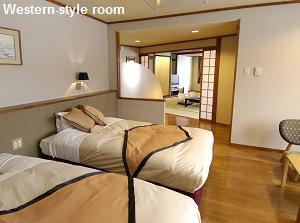 "Ryokan" is the inn in Japanese style, and the common accommodation in Japan. In any ryokan, an attendant serves the lodging needs of you. Generally the attendant is a lady wearing a kimono, and she carries your luggages, takes you to your room, and gives you the presentation of the lodging in the ryokan. Basically the room is tatami-floored. So you have to take off your shoes and go into the room. Especially large hotel has great bathrooms with bathtubs like a pool. We Japanese enjoy taking such bath. Commonly one dinner and one breakfast are served for one night's lodging. 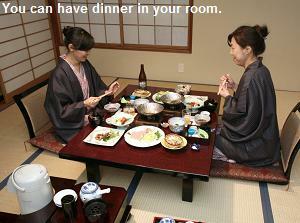 You can enjoy your meals in your room or at the restaurant in the ryokan. It depends on the way of ryokan. Both a dinner and a breakfast have many dishes of Japanese food. Most dishes are served on the table from beginning, please taste them as you like. At the end of dinner, rice and a cup of miso-soup are served. Of course, you can order some drinks at extra. After the dinner, other attendants move the table aside and lay out futon in your room. Your room changes from a guest room to a bedroom. 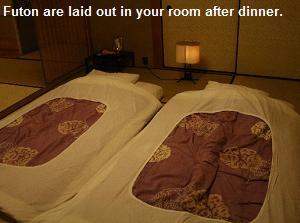 When the dinner is held in a restaurant, the attendants enter your room to lay out futon without asking. Of course, they aren't thieves. Trust has been built up between Japanese people and any ryokan, so no Japanese guest complains. "Hotel" is maybe the accommodation which you know well. It has the rooms with one or two beds and a bathroom. 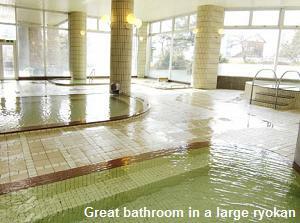 Also the big hotels in sightseeing area have many Japanese rooms and a big bathroom like ryokan. Generally the hotel have a few restaurants and the hotel guests enjoy dinner and breakfast there. In addition to such big hotels for tourists, there are the hotels which have the small rooms with only a bed and a bath for business people. Most of them have no restaurant. Such hotels are mainly in the center of city and are economy. We Japanese call these hotels "Business hotel" and the hotel industry calls them "City hotel". If you are a normal traveler, you had better select the hotels above. But if you don't have a place to stay in a big city, the next hotels have possible. 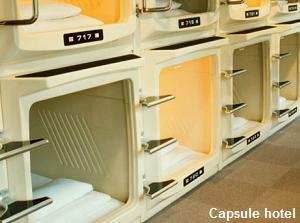 If you are a male, there are the "Capsule hotels" in Japanese in a downtown area. Many boxes are lined like a sleeping car of train. One of the boxes is your room, and have only the space that you can lie. A television and air conditioner are equiped. The rate is very cheap and we can check in late at night, so most lodgers are businessmen. I don't recommend, but if you are a couple, there are the "Love hotels". The sign says "Hotel", but most of them are fancy building and the windows are small. "Minshuku" is like small ryokan. Most minshukus are around sightseeing area, swimming beach, ski resort, hot-spring area, base area of hiking and so on. 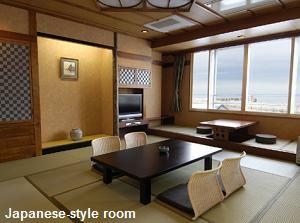 Most of minshukus are family-run, and have only several rooms in Japanese style. 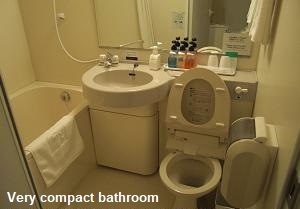 The lavatory and bathroom are generally communal. Some minshukus have only shared rooms. Basically one dinner and one breakfast are served for one night's lodging, and all lodger have the meals at the same time at the same dining room. The rate of minshuku is cheaper than ryokan. The meals are not so rich as ryokan, but fresh fish and vegitables produced around there are used. Sometimes, you have the chance that you can eat the fish which the host caught and the vegitables which the hostess harvested. Probably you can enjoy a Japanese family atmosphere. "Pension" in Japan means "Minshuku in Western style". The appearance of the house, the rooms with beds, and the menu of meals are western-style. Like minshuku, one dinner and one breakfast are served for one night's lodging, and all lodger have the meals at the same time at the same dining room. Most of pensions are around seaside or hill resorts. Pension of Western style is more sophistcated for Japanese than minshuku of Japanese style, so it is popular with young ladies and young families. The rate of pension is cheaper than ryokan, but is slightly more expensive than minshuku. "Shukubou" is the accommodation in Bhuddist temple. Originally it was the accommodation for ascetic monks, and then it became the accommodation for pilgrims in Edo period. But even if you aren't a Bhuddist or aren't interested in Bhuddism, you can stay there. The accommodation of shukubou is almost same as minshuku. Generally the meals are all vegetarian dishes. But I hear that many shukubou recently serve fish and meat dish. Also you can order alcohol. All temples in Japan don't have shukubou. The famous shukubous are around Dewa 3 mountains in Tohoku district, around Zenkoji Temple in Nagano, around Minobusan Mountain in Yamanashi prefecture, some temples in Kyoto, around Koyasan Mountain in Wakayama prefecture, many temples on the pilgrimage route in Shikoku Island, and so on. If you want to stay a shukubou, you had better make a reservation. The rate of shukubou is slightly cheaper than minshuku. Youth hostel is the cheap accommodation originated in Germany for young people. 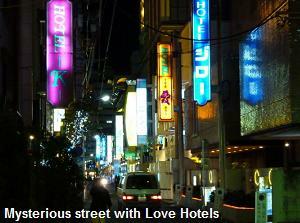 In Japan there are about 300 hostels now in the main cities and around sightseeing areas. The rooms, baths and lavatories are basically shared with the boys and girls separated. Formerly the lodgers had to do the preparation of dishes, the wash of dishes after your meal, the cleanup in your room and so on, for educational purposes. But the style of travel has changed and the use of hostels has decreased in recent decades, so you need not do them in most hostels today. Recently you can drink. In many hostels, the manager help the meeting in the evening for guide of sightseeing or deepening the friendship of the lodgers. If you request an accommodation which is very cheap and have only a bed, that is "Guest house". Guest house is increasing in Japan, and most guest houses are for foreign or Japanese backpackers. 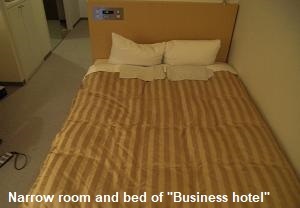 The rate of guest house is maybe about half of "business hotel". And the room is relatively comfortable. Basically common Japanese travellers except backpackers don't select this accommodation, so they know little about this information. If you want to use this, you had better check the information in advance. You can find many guest houses via the internet by searching by the keyword on "guest house" and city name. It's to be noted that some guest houses are the monthly contract apartments. There are many cheap lodging houses around "San'ya area" in Tokyo and "Airin area" in Osaka. In these area, there are many poor daily workers and homeless people. Recently the lodging houses in these area are popular with the foreign traveller. Because the rate is cheaper than half of a city hotel and the rooms are surprisingly comfortable like guest house. And these area are safer than foreign cities despite a slam. I hear that these informations have been spread by word of mouth on internet. If you want to travel cheaply as possible, this is an option.